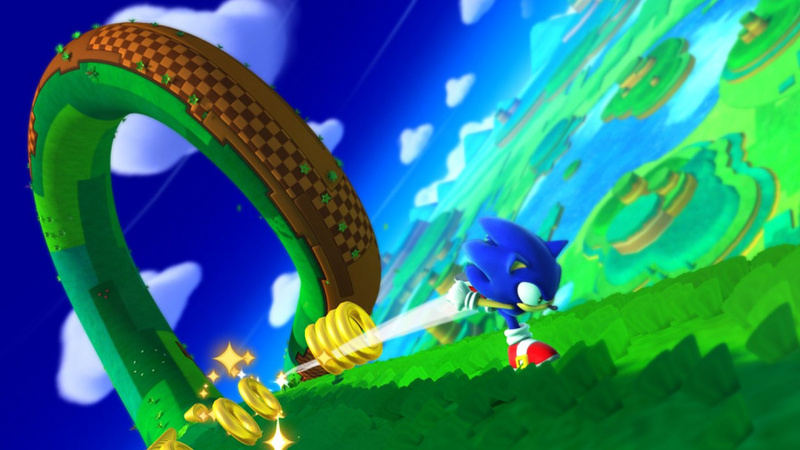 With Sonic Lost World now powering up a spin dash for its October release on the Wii U and 3DS, those most interested in a purchase have the usual choice of sticking with a retail disc — old skool — or opting for an eShop download instead. Those considering the eShop route may want to know that it's a fairly meaty download on both systems, particularly on the Wii U. The Wii U version will demand 8475MB / 8.37GB of space in Europe, which we imagine will be similar in North America. As for the 3DS title, it runs off with 10,253 blocks, as they're still known on the handheld, which amounts to roughly 1.25GB. Clearly those HD visuals demand a lot more resources, and on their respective platforms these can be considered as medium-sized retail downloads, though SEGA's effort on Wii U is certainly more memory hungry than Nintendo's first-party efforts to date. 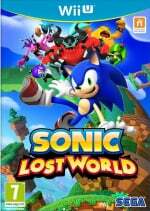 Are you considering picking up Sonic Lost World on either or both of the eShop stores, or would you rather have a disc or cartridge to hold? Let us know in the comments below. I have the 3DS variant pre-ordered via cartridge. I'm hopefully getting the Wii U version on-disc for Christmas. Plainly, I try to get retail unless it's for PC. I was planning on getting this game on a disc. This will not be changing my mind. I'll pick the 3DS version on e-shop. Also getting the disk, loving the cover art for most of these Wii U games. Download! It'll help justify my 2 TB (maybe 1 TB? I don't even remember) hard drive, and I'll get DDP points back!! Any news on the Wii Sports Club and Wii Fit U file sizes? I'll be downloading this and picking up an external drive. While I love having the physical media, I'd rather save money on tax due and get some cash back with the Deluxe Digital Promotion. On-disc for me. IMO physical media is still the way to go. Unless the game is more suited as digital (like Animal Crossing) or the game is only released digitally. Same goes for other platforms. Physical disc for me as well... I much prefer it over digital medium. I always go physical disc on everything (except monster hunter 3U this weekend because of the half off deal). Just because I like to be able to sell or return it if I ever want to. I also like showing off all of my cool game cases. Getting a physical copy for Wii U on a side note I wonder when Nintendo is going to cave in and release a Wii U with a larger storage capacity. I imagine a bunch of people already got, or are on the cusp of getting external drives now after the double combo of Pikmin and W101 on their HDD's. That said always nice to know in advance. The smaller size of the 3DS one has me worried it is going to be incredibly watered down. I already planned on waiting to get this, so now I will wait to see which one is better, I already bet the Wii U one is. Of course it'll be watered down, it's not HD. Where can a guy find some freaking 3DS screenshots? It seems NL always posts WiiU screenshots on multiplatform titles. Discs are the only way to go for retail titles. Even some of the "smaller" eShop games are getting full of "bloat." I downloaded Giana Sisters the other day and it took up 3 GB!!! Geeze, even with the 32Gb Wii-U, there won't be any room for downloading retail titles. Buying on Amazon (with no sales tax) is basically the same as utilizing your DD Promotion $5 to pay off the sales tax. So I don't see how downloading "in order to get the DD Promotion" is a justifiable reason for downloading. @luke17 I buy from the eshop so no sales tax and I get the DDP cash. The ease of having everything on the console and not listening to the disc drive is nice too. I'll get the Wii U version physical, and I'll consider getting the 3DS version digitally, just for the sake of having a Sonic game stored on my system digitally. I'm technically more interested in the digital version since I still have some credit to use on the WiiU's eShop, but little problem: what about the "deadly six edition"? Was always thinking physical, this just confirms it. I do not want to buy an external hard drive any time soon. I'm not the biggest Sonic fan but this is getting a bit interesting for me. Ill wait for a review as the 3d interests me more then 2d Mario. If its anything at all like 3d Mario then I might get it! No biggie. I'll get the disc and cartridge versions, if I even buy the game at all. @Zyph i completely agree with you unless there's a benefit to having the game digital like Animal Crossing i prefer the actual physical copy. Just preordered from gamestop. Although they couldn't confirm the deadly 6 edition yet. It's still only 50,that's a bargain for a new epic looking release..
Pedantic? Perhaps, but also correct. Do you not have to pay sales tax on your eShop games? I do. The $5 DDPromotion pays for a portion of my sales tax but the game still ends up close to $61 AFTER applying the $5 eShop credit. @ECMIM NAND is flash memory which is still memory. Proper carts are also memory (ROM) post GBA carts are something inbetween. @BakaKnight I'm wondering the same thing. I really want the deadly six edition, but I'd prefer to download the game. At the moment I have it pre-ordered, but I'm hoping that right near release there will be some news about the deadly six edition on the eshop. Hm. File sizes like that remind me of how stupid it is that Wii U only has 32GB in it. Disc inside a case for me. If only the DDP made the download cheaper than physical, then I'd download full retail all the time! Looking forward to the day we see eShop pre-orders. This would already be purchased and awating its release date to start downloading automatically. I see that you did there "Dash Away Memory" :3 anyway that is a lot of memory, well I hope the 3DS version is as good as the Wii U is. Every recent game I've picked up and every future game that I purchase will be digital. That DDP isn't going to use itself. I'd love to see a special edition Wii U bundle for Lost World, with a blue console and gamepad. I'd buy it! Digital. I have no interest in physical media anymore. Physical is the way to go. I had an Xbox 360 and had more than $300 spent in digital games and I got $0.00 back from trading them in when my Xbox broke and gave me an error. At least the physical version will make me save some money on an Xbox One in case my Wii U breaks! 8GB? No biggie. I'm never going to run into storage problems on my 2TB hard drive. Although I'm fast running out of space on my 3DS 16GB SD card and this might kill it. Not sure if I want the 3DS version yet though! I'm getting the retail version. So no problem. Physical and digital both have so many pluses. Lately I've only been getting physical discs if there is a sale or a buy 2 get 1 free promo locally. Other than that I'm really enjoying the convenience of digital and never thought I'd abandon my cases. I started to lose interest in physical when physical started losing interest in worthwhile instruction manuals. They've gotten so short! @Jazzer94 Nintendo doesn't generally cave. They seem pretty set on having users pick up their own externals to (possibly) keep costs down. I have a 250gb Western Digital drive working great with mine. As much as I appreciate SEGA putting this exclusively on Nintendo hardware, I have been burned many times by Sonic games. I will need to try before I buy. I am always getting digital simply because it saves money with no tax for it here! I got a big enough HD for it anyway! I have a Wii U and 3DS, so I will pick up the physical Wii U version when I get around to it. What is meant by "SEGA's effort on Wii U is certainly more memory hungry than Nintendo's first-party efforts to date"? Does it mean Sega is making more effort than Nintendo, or does it mean Sega games are more memory hungry than Nintendo games?